Horse teeth are VERY different from human teeth. First and foremost, they grow – continually. Sometimes your horse may develop very sharp points on their teeth, from uneven grinding while eating. This can lead to the inability to eat or digest their food well, and/or may cause discomfort within their mouth, specifically while being ridden with a bit. This is why they need to be “floated” from time to time, i.e. filed down. 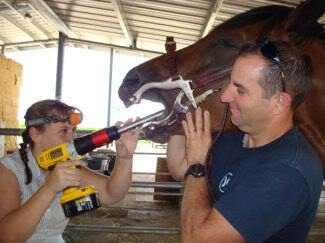 It’s VERY important that your horse have his/her teeth checked regularly (we usually check 2x a year at vaccine time! ), which will help to catch any brewing problems before they become huge issues. Horses, just like people, can develop cavities, gum disease, etc. Another difference between horses and humans though, are that the nerves in the horses’ teeth are nowhere near the top of the tooth, which makes the whole “teeth floating” thing much less scary. In fact, it’s usually a very simple and painless procedure! 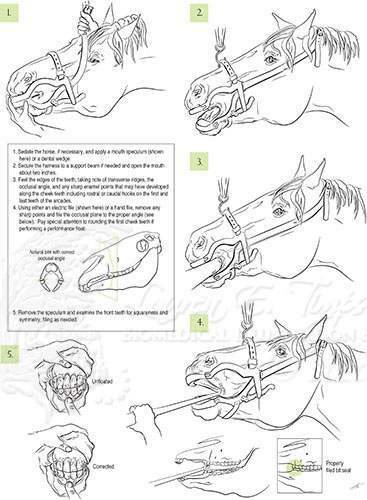 The horse is usually lightly sedated, and then the veterinarian or equine dentist gently files the teeth down with a “float” (big file) or a power float (see picture).